This is Harry's place and will remain as a tribute to my handsome hairy boy. I've been digging out some old videos of H, and have put them together into a small compilation. The music is Days by Kirsty MacColl (Harry and Cassidy tell your mum thank-you) and The Long Road by Mark Knopfler. I think this shows what H was like more than any photo can. 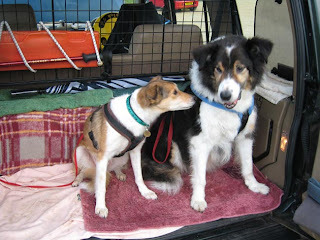 Sally has some news to tell you all, but I've told her she has to wait a while. After all his problems of the last 18 months his tired body couldn't fight an infection he caught. My vet tried his hardest to keep him with us, but couldn't even get any blood from him to test as his immune system was shutting down. He was a big dog with an even bigger heart, the love of my life, my soulmate. R.I.P. my Huge Happy Hairy Handsome boy. 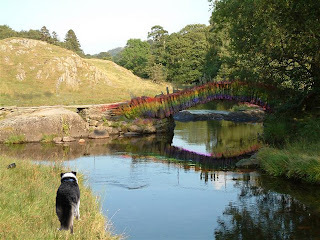 PS Thank you all so much for all your kind words and comments, It really does help to read them and know there are folk out there who understand. I now know why Pippa was moaning about her mistress not doing what he wanted her to do, I've had the same trouble with my mum, I've not been able to get near MY PC cos she's on there all the time messing with photographs and other silly stuff, I've just managed to sneak on here for 5 minutes, so firstly let me say sorry to all my pals who I've not visited for ages, all you who've been ill or having tests, and all of you who've got new brothers or sisters, I haven't forgotten you. 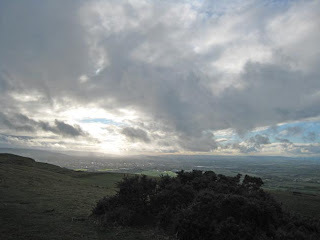 We haven't been out much recently, cos of Sally being in season, mum says as much as she likes her she doesn't want a load of little Sallys, but we eventually managed a trip to Cleeve Hill. It was really really really windy and cold too. Sally told me she didn't like it at all and that she was scared of the wind, but I protected her and told her not to be so silly. 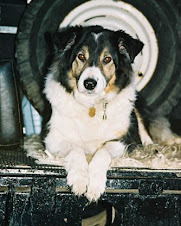 Thank you all for your healing thoughts, Deb has phoned my mum to tell her that Hector is now doing well. He was operated on on Wednesday and had 2lbs of water drained from his lungs and around his heart. He has had the medication for his hyperthyroid increased and is also on water retention tablets, he will be strictly monitored for the next week, and the vet is hoping the increase in medication will solve the problem, if not he will then have to take heart tablets too, but at the moment he is eating well, puring loudly and looking amazing. Thanks again, all of you. I'm err? 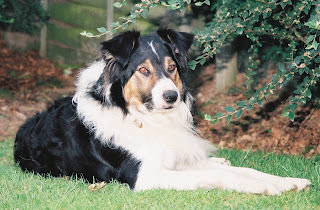 some sort of Collie.....I think.My Mum adopted me from The Border Collie Trust (that's why I think I'm a collie) in 1999, they think I was about 2 or 3 years old.Before that my life's a blur, though I am told I was found in Monmouth, Wales. 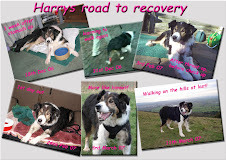 You can read all about my 'Road to Recovery' on Pippadog's Blog.